MKV is a container format, a kind of Matroska media files, Matroska is a new multimedia package format, also known as multi-media containers (Multimedia Container). It can be a variety of encoded video and more than 16 different formats of audio and subtitle streams in different languages package them into a Matroska Media files. When trying to play MKV files in Windows Media Player, you may find it shows audio only but no video or other abnormal playback problem. "Hi I have Windows Media Player Version and it will not play MKV files. Where can I get a reliable codec or reliable way to enable my media player to play mkv files? I have Windows 10." According to Microsoft Windows Media Player list, we can easily find that Windows Media Player doesn't support MKV format natively. Then is there any way out to use Windows Media Player play MKV videos? Definitely Yes! In this article, we will offer you 2 useful solutions in the following parts. In fact, there are 3 popular codec packs for Windows Media Player. This is a DirectShow filter pack, includes almost all you need to play .mkv (matroska video) and .mka (matroska audio) files under DirectShow players. After this codec pack installed, Classic Player or Windows Media Player can play video animation MKV format right now. A famous full pack, not only for playing matroska media files, but it will also allow playback of most modern video formats on any DirectShow player, work with Windows Media Player. It is a versatile codec pack for Microsoft Windows Media Player containing overall modern video/audio file types, of course MKV and supporting SD and HD resolutions, 720P, 1080P, 4K or even 8K. Step 1. You will be familar with the following message saying that you cannot reproduce your file with Close or Web Help options if you open MKV videos in Windows Media Player. Click on Web Help, you will be relocated to the website help and in the main page, you will find a codec link under Codec is Missing. The link is so you should click on it and open it. Step 2. In the plugins page, inside the search bar, copy and paste the link to open the codecs package. Step 3. Download and run to Install the codecs following its proper instructions. Step 4. After that, it will ask for settings, so for that click on recommended settings option. Note that if your system is using 64-bit, then opt for 64-bit versions for windows. 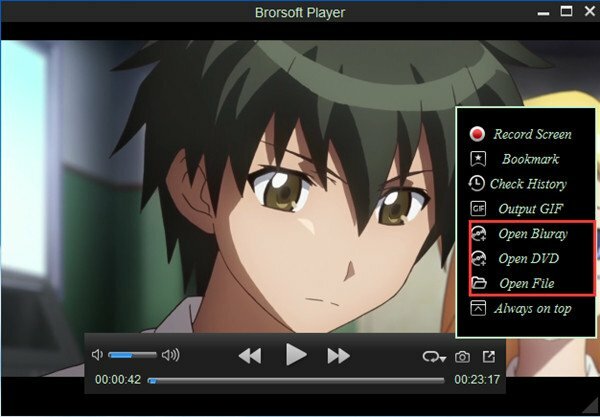 Now, you can reopen your MKV video file with Windows Media Player without problems. However, as far as we know, installing an external codec pack for Windows Media Player on Windows takes up more storage than a self-integrated MKV player, and may be bundled with malware unless carefully scanned. Therefore, we offer the second solution to play MKV videos. Brorsoft 8K Video Player (Mac version) is such a perfect video player for users. It meets all demands listed above. You can freely download it on computer and play the videos you want. The playback process is much simple. Install and launch this best 8K Video Player for Windows/Mac, either drag&drop MKV videos to the main interface directly; or Click "Arrow" button to add the target MKV files. That's all. Now, it's time for you to enjoy the videos.